A big day Saturday October 17 at the SAA trial in Aberdeen. 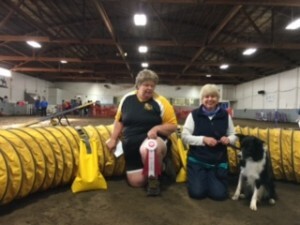 We had two great teams achieve their Agility Trial Champion of Canada title, commonly referred to ATChC. 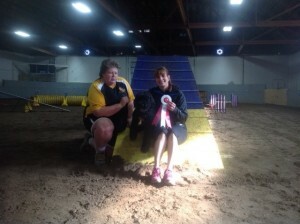 Thanks to judge Cindy Swiney on some great courses. The day started out with Denise and Maddie getting a qualifying round in Masters Gamble to give them ATChC. A little bit later in the day Joan and Cinder achieved a qualifying round in Maters Snooker to give them their ATChC. Way to go! !